The Pentagon and HUD can't account for $21 trillion over just the past 17 years—enough money to pay back the current U.S. national debt. Washington, D.C. – A new report analyzing the budgets of both the Department of Defense (DOD) and the Department of Housing and Urban Development (HUD), found that between 1998 and 2015, these two departments alone lost over $21 trillion in taxpayer funds. The shocking report was authored by Dr. Mark Skidmore, a professor of economics at Michigan State University, and Catherine Austin Fitts, former assistant secretary of housing. It notes that the missing funds are a direct result of “unsupported journal voucher adjustments” made to the departments’ budgets. The report notes that, in both the private and public sectors, the presence of such adjustments is considered “a red flag” for potential fraud. 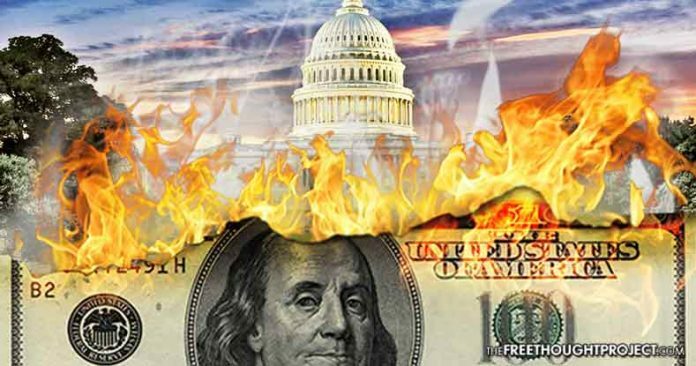 The amount of money unaccounted for is enough to pay back the whole of the U.S. national debt, which currently stands at roughly $20.5 trillion, and still have a half a trillion left. Even more startling, the total amount of missing funds—$21 trillion—is most likely much higher in reality, as the data used for the report was incomplete due to the researchers being unable to recover complete data for every year analyzed. Perhaps even more troubling than the total amount lost is the fact that fraudulent behavior from HUD and DOD seem to be the standard operating procedure. In fact, the accounting for these funds is so poor, that as Reuters notes, the Defense Finance and Accounting Services (DFAS) refers to the preparation of the Army’s year-end statements as “the grand plug” — “plug” is accounting jargon for the insertion of made-up numbers. For every transaction, a so-called “journal voucher” that provides serial numbers, transaction dates and the amount of the expenditure is supposed to be produced. The report specifies that the agency has done such a poor job in providing documentation of their transactions, that there is no way to actually know how $21 trillion dollars has been spent. Essentially, the government has no way of knowing how the Pentagon has spent the trillions of taxpayer dollars allocated by Congress for national defense. In turn, employees of the DFAS were routinely told by superiors to take “unsubstantiated change actions” commonly referred to as “plugging” the numbers. These “plugs”—which amounted to falsifying financial records—were then used to create the appearance that the military’s financial data matched that of the U.S. Treasury Department’s numbers when discrepancies in the financial data couldn’t be accounted for, according to a Reuters investigation. Furthermore, in 2015, DFAS was unable to accurately put together the year-end statements for the department, as more than 16,000 financial data files had been erased from its computer system. Unlike other federal departments, the DOD has never been subjected to an annual audit. While the U.S. government established requirements for each agency to present financial statements back in the 1990s, for more than 20 years, the Department of Defense has lagged behind other agencies that were following modern accounting standards, reporting what they received and spent. In 2010, Congress included a requirement in the National Defense Authorization Act that gave the military “an extra seven years to clean up the books and get ready,” as Sen. Chuck Grassley, R-Iowa said last year. That set a new deadline to be ready for an audit by September 2017. Only days ago the Pentagon announced that it would undertake its first audit in history. “The Defense Department is starting the first agency-wide financial audit in its history,” the Pentagon’s news service noted. “Beginning in 2018, our audits will occur annually, with reports issued Nov. 15,” said David L. Norquist, the Defense Department’s comptroller. The likely reason for the traditionally lax oversight is the fact that government contractors and weapons manufacturers are often the largest beneficiaries of excessive waste and unaccounted funds. The fact that defense contractors spent upwards of $30 million on donations to political campaigns last year provides Congress with a motive to cover-up the massive and systemic fraud, as they fear biting the hand that feeds them. While the Department of Defense and HUD can’t account for $21 trillion dollars of taxpayer funds, in 2014 there were 47 million people, including over 15 million children, living in poverty in the U.S.—15% of the U.S. population—which is the largest total number in poverty since records began being kept 52 years ago. Please share this story if you are appalled by the fact that there are Americans that are homeless and hungry, including U.S. combat veterans—while the government is unable to account for $21 trillion dollars of taxpayer money.